Besides, it’s National Ice Cream Month, or as some call it, July! You can thank President Ronald Reagan who proclaimed July National Ice Cream Month in 1984 and established the third Sunday of the month as National Ice Cream Day. Why not celebrate ice cream’s honorary month by picking up one or several of Homestead’s premium cow to cone options? The freezer case is stocked with Bassetts, Goodnoe Farm, and Bhu’s homemade Thai Coconut ice cream. 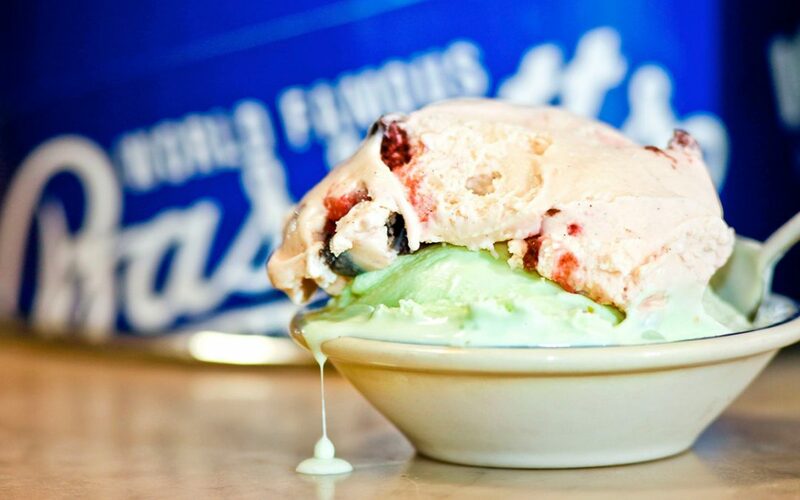 Bassetts, in the iconic blue and white carton, is one of the oldest ice cream manufacturers in America In 1861 Lewis Dubois Bassett, a Quaker school teacher and farmer, began making ice cream in his backyard with a mule-turned churn. He sold his wares on 5th and Market Streets in Philadelphia, eventually opening a retail store in The Reading Terminal Market. The secret to Bassetts’ yumminess is the base recipe which is high in butterfat — one of the hallmarks of premium ice cream. If you grew up locally, you already know the goodness of Goodnoe’s, a local favorite for generations. The Goodnoe family’s commitment to wholesome, high quality ice cream dates back to1918 with John and Mabel’s dairy farm. Years later their son “Skip” opened The Goodnoe Family restaurant and Dairy Bar, a Newtown, Pennsylvania landmark for 33 years. The original family recipe is now in the hands of Skip’s son Colin who uses the finest ingredients to continue the family tradition of old-fashioned quality. Homestead’s resident Thai chef is also an ice cream maker. Check out Siam’s Coconut Ice Cream prepared by Bhu. It’s all natural and traditional Thai Coconut ice cream made with just four ingredients — coconut milk, sugar, salt and half & half.